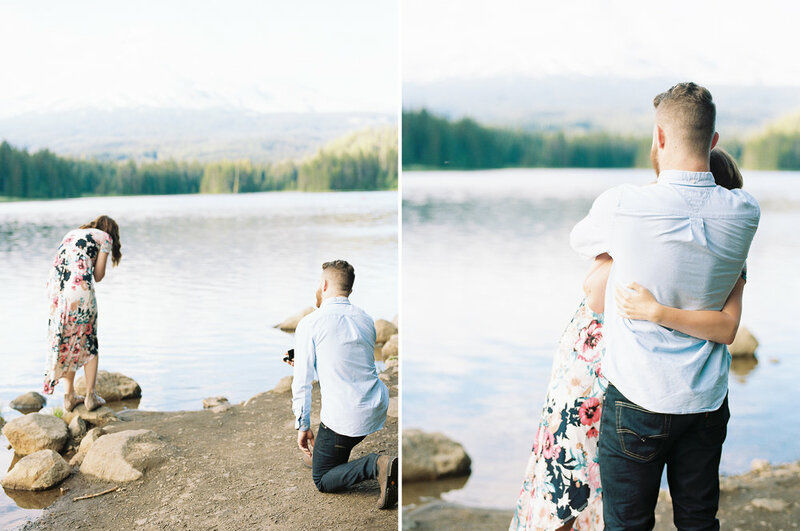 Shooting secret proposals is one of those session types that I wish we could shoot more of, but it's definitely NOT for everyone. 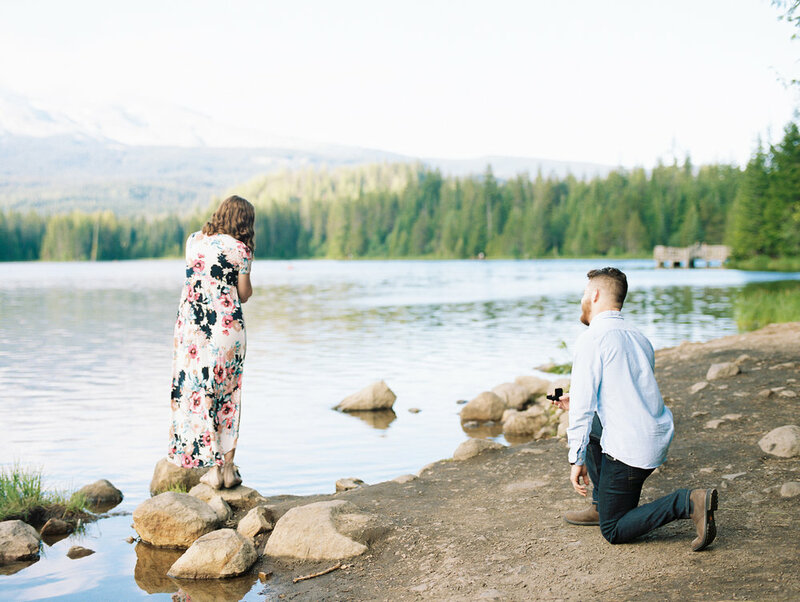 But for those who opt to surprise their babe with not only a shiny ring, but also photos of the special moment, are definitely bring us photographers a lot of joy. Surprise proposals are also VERY tricky...because they're supposed to be a surprise. In our experience actually, we've never had to hide behind trees or cars to capture the event, but actually working with the couple before it even happens. The trick is, finding the RIGHT excuse to keep it a secret. Personally, I loved Keith's disguise. He promised Jenny I was just getting started in this business and needed couples to pose for me to grow my portfolio! At first, Jenny didn't believe him. But he swore up and down this wasn't the moment he would propose...whoops! Jem and I arrived at Trillium lake about an hour and a half before Jenny and Keith would. We wanted to have enough time to walk around and find the PERFECT spot. It was on a weekend, and a gorgeous one at that, so our biggest issue was finding a spot out of the way of the crowds that still had a nice view! When Jenny and Keith arrived, it was time to put on that super casual vibe as to not alarm Jenny of any big events ahead. Keith planned ahead and delivered the ring to us a couple days before the proposal so there was no chance of her ever finding it on the day of the photoshoot. I should say, acting natural with this kind of pressure, as well as making sure we kept the ring nice and hidden was quite the challenge! But, thankfully, this wasn't our first proposal so we managed to smoothly slide the ring to Keith when he was ready to make the big move. After tears, laughter, and phone calls to their family, Jenny and Keith took us to a private campsite they rented for the evening to let us finish up a roll of film. This was also the perfect opportunity to capture the two in their element. Relaxed, watching the sunset by the fire with a glass of bubbles in hand. All in all, it was nothing short of a perfect day.